This LYRDT-930 flexo wire side stitching line (exercise book production line) is a kind of machine to process paper books in binding and finishing, by means of joining pages together by driving thin metal wire (i.e., staples) through the cover of a publication along the binding edge. This machine made in our company is developed based on the flexo ruling machine series, as well as absorbing advanced technology from foreign machines. It is especially suitablew for producing wire side stitching exercise book, note book. We adopt advanced parts for the machine, to ensure great performance. Take one of the key part, electrical control system, as example, we use the most advanced Fieldbus Control System and Non-axle servo control system, which in turns leading to harmonious working for each part of the machine. 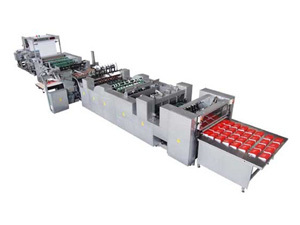 Working flow of this machine is that, releasing the web, flexo printing (double side), sheeting, counting and stratifying, auto covering, wire stitching, folding, back planning, cross cutting, and completing the finished product. 7. Speed: Folding, back planning, and trim front side: speed and size is adjustable. Founded in 2009, Shanghai Pripack Machinery Co., Ltd. has continually focused on providing a wide variety of paper bag making machine, paper coating machine, laminating machine, flexographic printer, paper processing, printing and packaging machinery for customers around the world. We are very familiar with international market of paper bag making machine, hot foil stamping machine, flexographic printer, printing machine, paper processing, printing and packaging and its trend of development. With products of high quality assurance and CE certificated, we are sure to provide our customers with the best products at competitive price.